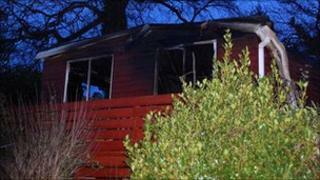 A body found in a badly burned wooden chalet in Cornwall has been identified. Firefighters recovered the body of 47-year-old Kevin Mark Orchard from the chalet at Trewhiddle Holiday Park near St Austell on Monday evening. The fire was described as severe and crews had to use breathing apparatus to get into the building. Devon and Cornwall Police said investigations were continuing into the cause of the fire, but it was not being treated as suspicious. A file will be submitted to the coroner.